Hoberman (I Know an Old Lady Who Swallowed a Fly) takes off on another golden oldie, giving the ditty about a cow and the Chicago Fire an upbeat ending. 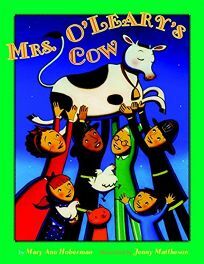 The winking cow still knocks over Mrs. O'Leary's lantern, but while the refrain remains ""There'll be a hot time/ In the old town tonight!,"" the flames in this story never spread beyond the O'Leary barn. What's more, the cow, who has climbed on the barn roof (""She looked just like a ghost./ And as the flames crept near,/ We feared that she would roast""), is rescued by a team of heroic firefighters (""Thank you! Thank you! Thank you!""). Unfortunately, while Hoberman's previous versions of old kids' songs, done in partnership with Nadine Bernard Westcott, were goofy delights, this effort never really, well, catches fire. Mattheson (No Bows!) uses catchy, vibrant colors throughout, and her tableaux benefit from dramatic lighting and perspectives. Still, her characters in particular feel somewhat distant, and this retelling fails to capture the giddy, mischievous feeling of the original song and the sheer silly joy that comes from singing it. Ages 3-6.